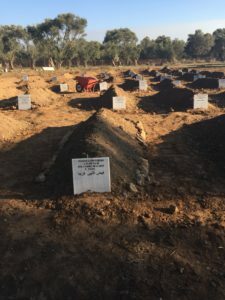 A statement from Last Rights proposing international legal standards for proper and decent treatment of migrants who die at Europe’s borders, and their families, is a vital campaigning tool. As Europe’s leaders focus on border security and rescuers are criminalised, more migrants die. In the first five months of this year, the death rate among migrants crossing the Mediterranean doubled, compared with last year, according to UN data. As well as resisting the deterrent policies, it is important to ensure that those who die at the borders are treated with dignity and respect. In her first Reith lecture, Hilary Mantel, author of Bring up the Bodies, said ‘Even if we have no religious belief, we still believe what has been human should be treated as human still: witness the indignation if a corpse is desecrated, and the agony of those who have no bodies to bury.’ She was not talking about migrants, but her observation applies with force to those who die making the hazardous journey to safety and security, whether in the Mediterranean, the deserts of America or Africa or the seas around Australia or south-east Asia. The Last Rights project was set up by lawyers involved in helping refugees in Lesbos, to press for a binding legal framework setting out states’ obligations to the migrant dead and their families. Currently, no such legal framework exists. When boats sink in the Mediterranean, bodies may or may not be recovered; bodies washed up on the shores of Greece or Turkey, Italy or Libya may or may not be identified, relatives may or may not be traced and told, and the dead may or may not receive a decent burial. What the group wants to achieve is a mechanism whereby a group of standard core obligations towards the dead are internationally accepted and enforced, without placing all the burden of compliance on the coastal states along the migrant routes. to provide special protection for children. In seeking to identify a firm legal basis for each of these obligations, the authors creatively draw on existing international humanitarian and human rights law (humanitarian law is narrower than human rights law, dealing only with states’ obligations in armed conflict). Maritime law and international criminal law are also drawn on, for search and rescue obligations and protection from the acts of traffickers and smugglers. So for example, the obligation to search for missing persons at sea is derived from maritime law (the duty to rescue those in distress on the high seas), complemented by human rights law on the right to life, which includes protection from known and imminent threats to life from the illegal acts of third parties (smugglers who overload unseaworthy vessels). Additionally, the recognition in humanitarian law of the right of families to know the fate of their relatives is deployed in aid of the search obligation. The family’s right to know is also highly relevant to the obligation to identify bodies, and to trace and notify relatives. Identification of bodies is an important part of an effective investigation into death which forms part of the right to life, recognised as a fundamental human right. Strangely, international law does not deal with the treatment of the dead – their collection and disposal – except on the battlefield, in situations of armed conflict, where the obligations are precise and detailed. But as the authors point out, ‘the requirement that the dead be treated with respect and dignity existed as a fundamental human value long before there were any attempts to identify and codify international law.’ So in respect of collection of and respect for bodies, the issue of a death certificate, and burial obligations, the authors seek to use states’ obligations during armed conflict as the standard for treatment of migrants’ bodies. The importance of these obligations for the bereaved is obvious. Without identification of bodies, and without an obligation to trace and notify next of kin, families simply do not know the fate of their relatives. Without a death certificate, spouses cannot remarry, families cannot inherit or claim ownership of the deceased’s land or property, making them vulnerable to illegal dispossession. And if graves are not marked, families will never know where the remains of their relatives lie. Perhaps there also needs to be an obligation on states to grant visas to those bereaved, to enable them to mourn at the grave of their relatives who died in search of a better life – this too would be a matter of simple humanity. The Statement is an important campaigning tool, bringing together for the first time the core requirements for decent and proper treatment of the migrant dead and their families. It brings the project of building enforceable legal standards in this area closer to fruition. Last Rights: The dead, the missing and the bereaved at Europe’s international borders: Proposal for a statement of the international legal obligations of states.